The experts had said to bet on the Cleveland Indians as the computer nerds calculated the team couldn’t lose the World Series. Well, five games into the Major League Baseball playoffs and Cleveland is finished. The New York Yankees defeated the Tribe in five games. New York came back after losing the series’ first two games to take three straight. The Yankees now face off with Houston for the privilege to represent the American League in the World Series. Ahead of their game 5 win over Cleveland, the Yankees were +900 to win the World Series. What a great price! The Indians were +350. According to MLB statisticians, New York now has the third best chance to win the World Series. The Yankees are 45% likely to win the AL pennant and 22% likely to lift the World Series trophy. For so long an underachiever, the Washington Nationals are one win away from the NLCS. The team’s game 4 win over the Cubs has Washington on the verge of franchise history. Dusty Baker’s team was dominant in game 4, winning 5-0, and Chicago doesn’t look to have an answer to the team’s offense. Washington was an incredible +1400 before its game against the Cubs. If you got on that price, then you may see a great payout later on. The win at Wrigley edged the Nationals ahead of Chicago in probability to make the World Series. The Nationals are now 22% likely to make the series and 10% likely to win it. The Astros powered through their series with Boston and will now square off with the Yankees. At +275, the team doesn’t offer a lucrative price. Houston’s offense has been stellar and the team is 29% likely to win the World Series. If you weren’t swayed to bet on the team previously, you may be now. The Dodgers are at +225 to win the World Series and like the Astros, don’t offer a great deal of reward for wagering on them currently. The Dodgers likelihood of winning the World Series is high at 30%. It is the highest of the teams left in the playoffs. Los Angeles has successfully rebounded from its poor August and September, and the team looks like the Dodgers from before the All-Star Game. The team has the benefit of resting its pitching staff right now. Although that could come back to haunt them. 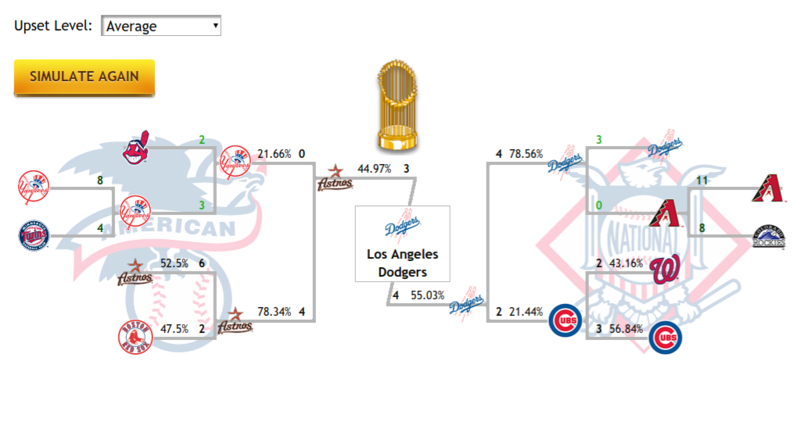 The ZCode System Playoff Simulator has crunched the numbers and it predicts the Los Angeles Dodgers to knockoff the competition. According the Playoff Simulator, bettors can expect the Cubs to beat the Nationals before losing to the Dodgers is six games. In the AL, Houston is predicted to sweep the Yanks in four, setting up a Houston-LA World Series clash. From there, the two teams will battle it out over seven games with the Dodgers taking the title. Agree? Then don’t hesitate to wager on the Dodgers. Click Here To Get Today's Totally Automatic Baseball Picks!